The holidays are here. I know, I know, you're tree isn't decorated yet and all the busyness of work, family, and school are getting the better of you. What better time than the holidays to escape the madness safely in a theater watching a classic remake. The new version of the Broadway classic is in to theaters soon and is the perfect movie for fathers and families. The Broadway classic that has delighted families for generations comes to theaters with a new, modern spin in Columbia Pictures' comedy, Annie. Academy Award® nominee Quvenzhané Wallis (Beasts of the Southern Wild) stars as Annie, a young, happy foster kid who’s also tough enough to make her way on the streets of New York in 2014. But everything’s about to change when the hard-nosed tycoon and New York mayoral candidate Will Stacks (Jamie Foxx) – advised by his brilliant VP, Grace (Rose Byrne) and his shrewd and scheming campaign advisor, Guy (Bobby Cannavale) – makes a thinly-veiled campaign move and takes her in. Stacks believes he’s her guardian angel, but Annie’s self-assured nature and bright, sun-will-come-out-tomorrow outlook on life just might mean it’s the other way around. Can you say "fatherhood story"?! Director/Producer/Screenwriter Will Gluck teams with producers James Lassiter, Jada Pinkett Smith & Will Smith, Caleeb Pinkett, Shawn "JAY Z" Carter, Laurence "Jay" Brown, Tyran "Ty Ty" Smith with a modern telling that captures the magic of the classic characters and original show that won seven Tony Awards. Get a Sneak Peek of Annie! 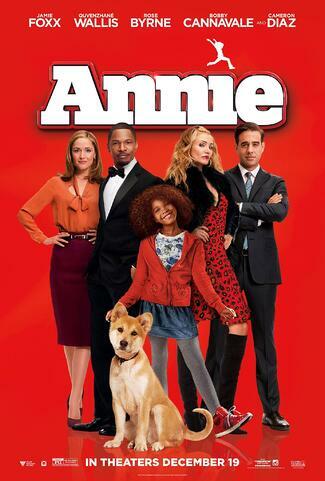 Watch the official trailer for Annie. "Read Today for a Brighter Tomorrow" was inspired by the upcoming film Annie. The reading program is perfect for mom, dad and child as it encourages you to read together and has a family reading activity -- Great Books Bring Families Together! The site also has reading tips for parents. As part of the reading program, Sony has created free Annie Activity Books, bookmarks, stickers and folded posters that we can give to fatherhood organizations—just email me at rsanders@fatherhood.org if you're interested. Focuses on the need for diverse books, providing lesson plans and librarian-created reading lists. Provides fun opportunities for kids and/or families to create Reading Journal Scrapbooks. Offers free downloadable coloring pages under "Annie's Corner". Also, if you, the fatherhood leader, would like to create a fun Annie Karoake Event, there is a free Annie Karoake App which can be downloaded from the App store! Stay tuned to the blog, I'll write about the insights I gained from watching this family classic soon.